Today we had a group cirt for our letters, this not only enabled us to define our strongest letterform but was also a good chance to see what other people in the class had produced. Firstly, we were split up into groups, when in these groups we had to select the five strongest letterforms out of the letters that we had produced so far. We each had a few minutes to describe the concept and then members of the group selected what they thought to be the strongest letters. 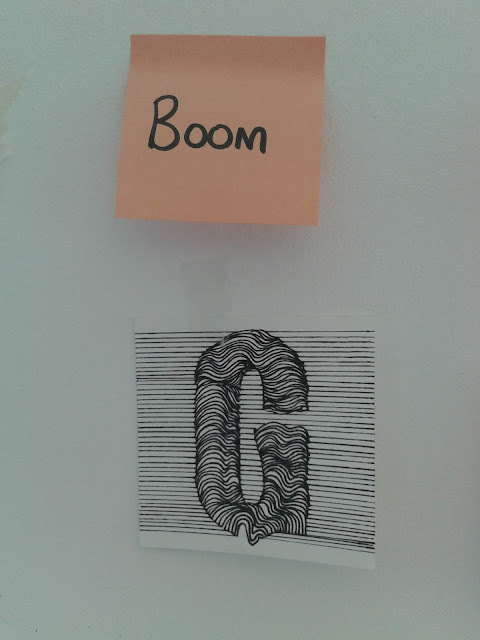 Additionally, then the letterforms where stuck up on the wall so they could be seen easily. 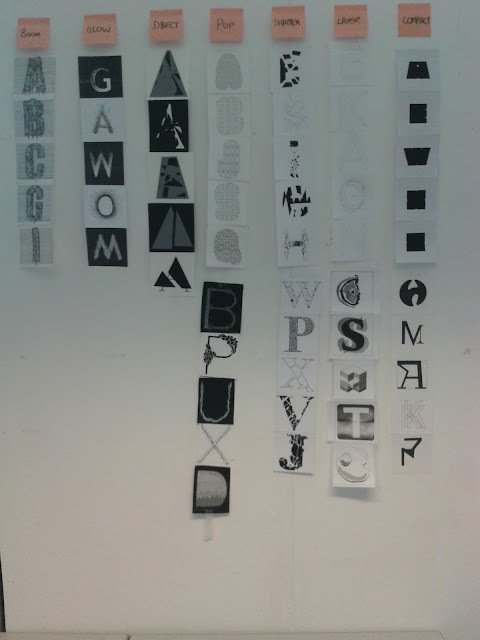 It was good presenting my ideas to the group, everyone liked my concept and how I had initially created the letters, my letterforms which were selected where A,B,C,G and I. Then our whole group moved tables, leaving our work behind. It was then the job of another group to refine the letterforms. Members of the other group had to remove one letterform each until the strongest was left. Using this letter as a start I now need to produce the alphabet digitally, we will be attending workshops that aim to introduce us to the skills needed to produce the alphabet on illustrator. I think that my font will work well as a digital font. When we first received the brief it stated that we would be visually communicating a word selected from the randomiser. We had to produce a set of letterforms to portray the word, which in my case was ‘BOOM’. I immediately associated the word with an explosion, but after researching the dictionary definition I realised that I was wrong, the first meaning given for the word was ‘To make a deep, resonant sound.’ I used this to form the base of my idea, I wanted to produce a typeface that used sound waves to form the letter shape. I didn’t want to follow the conventional idea of exploding type, as I wanted to produce something a little more creative. However, one thing I realised was that not everyone understood the concept straight away, if I was not there to explain the meaning some people would have been left confused. It is hard to find the right balance between a thought provoking concept and a design that doesn’t visually communicate the idea because its too complicated. I created the letters first by selecting a base font, this process can be seen in the design context of my blog. I chose a font called ‘Gabo Drive’ due to the boldness of the letters, and simplicity of form, I wanted to keep my base letters relatively simple as to not make the process of creating my letterforms too difficult and time consuming. After I had traced the base letterform, I started drawing straight horizontal lines from the edge of the paper to the edge of the letterform, this forms the quiet line of the sound wave. Once I had finished the horizontal lines I started with the waved line that formed the letter shape. I want the letters to work as a set, I encountered my first problem when I realised that the horizontal lines didn’t meet the lines of the next letter, making the font look disjointed. When reproducing my typeface digitally I need to make sure that the lines meet correctly. Ultimately, I am happy with how my letterforms turned out, I received good feedback from my class mates who all really liked the concept. On the other hand, some people found my design hard to understand without a relevant explanation, meaning my typeface does not visually communicate my chosen word completely. Finally, in future projects I need to consider how to visually communicate the message in a clear yet clever way.